How do I enable AMP for my Product Pages? Accelerated Mobile Pages (AMP) is a Google-backed project designed as an open standard for any publisher to have pages load quickly on mobile devices. When a page is indexed and listed on Google, the search engine will favor AMP enabled pages so that they load and display much more quickly for mobile platforms when someone clicks on the google listing. Your 3dcart store has the ability to use AMP on its product pages to assist with your store's SEO. Once there, look to the right hand side of the page and click on the +AMP for Product Pages icon. AMP is now enabled for all of your product pages going forth. It is important to note that AMP will only apply to product pages that are indexed and listed on google search results. The purpose is to have visitors who find your products through Google arrive at the store in a much quicker fashion by using the AMP enabled page. Going to your store's home page in a mobile browser and simply navigating to products will not show you the AMP enabled pages. Only links shown on Google for the product page will be seen in AMP mode. 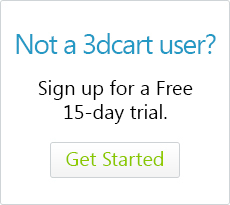 Although 3dcart automatically converts the product pages to AMP format for you, there may be certain elements present in your product page that can interfere with AMP. For example, iframe embedded videos or certain scripts that you may have manually added to the product's information. Typically, these are edits added through custom coding in the product's descriptions or custom fields or other areas of the product's information (in the Online Store Manager) that allow you to enter HTML. Fortunately, Google offers a free testing tool that will help you identify code issues that may trip up the product page's AMP coding. Simply click here and enter your product page's AMP URL to test it. The testing tool will let you quickly identify which customized areas of your product you will need to correct in order to work with AMP.